Whether you’ve never threaded a needle before or you are looking to go from hand stitching to machine sewing, buying the right beginner sewing machine can be the difference between starting out on your sewing journey and getting stuck at the starting line. Sewing machines are a great way to speed up any sewing project, but the learning curve of getting used to tension, bobbins, stitch types, and feeders can all be daunting for someone who is just starting out. That is why we’ve put together this list to take some of the guesswork out of choosing the best sewing machine for beginners under $200. When choosing your first sewing machine, there are a few things to keep in mind. First, look for something simple, but well-made. While you might love the idea of having over 200 stitches to choose from and completely automated tension, in reality, you might find yourself only using a straight stitch and getting frustrated by the auto threader. For a beginner sewing machine, you should look for something that has all the basics covered, but also keeps things simple for anyone just starting out to adjust to. You also want to avoid overly complex machines, such as many computerized machines that might confuse newer sewers and lead to frustration dealing with manual sewing machine settings in the future. You also want to look up plenty of tutorials when first starting out. While sewing machine manuals are a great took for anyone looking to keep their machine in tip-top shape, there is nothing like having someone walk you through winding a bobbin or using a zigzag stitch for the first time. No matter the beginner sewing machine you choose, be patient and take your time learning how to use a sewing machine. You’ll be whipping through projects in no time. Without further ado, here are our best sewing machines for beginners in 2019. The Janome Arctic Crystal Easy-to-Use Sewing Machine is a simple machine with basic features perfect for anyone just starting their sewing journey. With a few simple stitches and easy-to-follow tutorial videos and diagrams, this sewing machine helps you through the steps for adjusting tension, threading a needle, and choose stitches. As one reviewer pointed out, the Janome Arctic Crystal Easy-to-Use Sewing Machine is a “solid machine – simple stitches, and light enough to carry anywhere. 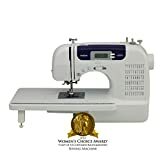 This machine is certainly marketed to and best for beginners or hobby seamsters and seamstresses looking to get a quality machine that will meet their needs without all of the bells and whistles.” The one thing to keep in mind is that this machine has a fair number of moving parts, including a removable machine arm that might confuse beginners, but overall this is a solid first machine for anyone looking to start out their sewing journey. 32 stitches, an overhead LED light for the sewing area, and an automatic buttonhole stitch all make this a great choice for anyone looking to learn how to use a sewing machine. One reviewer mentions that the Spiegel SP3201 Sewing Machine is “perfect for a beginner.” Its lightweight design makes it perfect for traveling to sewing classes as well. The only downside to this machine is that the stitch and tension selection controls can take some getting used to, however, there are plenty of tutorials and beginner guides to help walk you through the steps until you get the hang of the machine. But the Spiegel SP3201 Sewing Machine is easy-to-use and a great choice for anyone looking for a basic sewing machine. 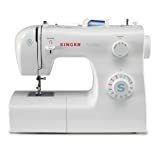 With almost 1,700 customer reviews, the SINGER Tradition 2259 Portable Sewing Machine is a great option for anyone looking for a compact. Easy-to-use beginner machine. With 19 built-in stitches, this is a great option for anyone looking for options without worrying about being overwhelmed by the options. The top thread setup may be a little challenging for a beginner, as one reviewer noted there was a “Bit of a learning curve with setting up the tension and using the correct needles.” However, this machine has a wide range of attachments that can be added on as you go along, allowing you to progressively upgrade your machine as you learn the ropes (or, rather, threads) of sewing on a machine. And for anyone looking to get into free-motion quilting down the line, this is a great option to sew through multiple layers of fabric without issue, making it an investment that will grow with you as you begin to improve. 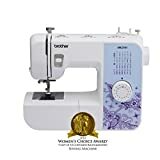 BEST SEWING MACHINE: Best sewing machine with quick-and-easy threading, adjustable stitch length and width, free arm, and on-board accessory storage. The Brother Sewing Machine XM2701 comes with an instructional DVD to take the guesswork out of setting up your own sewing machine, allowing you to take “It…out of the box and [have it] up and running within an hour,” as one reviewer noted. 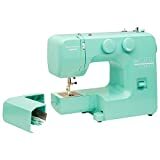 This sewing machine has more stitches to choose from than some of the others on this list, but its stitch selection system is intuitive and easy to get the hang of after a few uses. And with videos to help you learn how to set up the bobbin and the tension on the machine, you’ll be sewing along in no time.